Totally different mixes to those on the standard 12" (WAP4). A1 and B have both have an acid house feel to them (not totally dissimilar to the Sunshine Dub Instrumental), while A2 uses a a more traditional hip hop break. A1 and A2 both feature the rap from the single, B is a long instrumental. Both tracks are more stripped down than on the other 12". 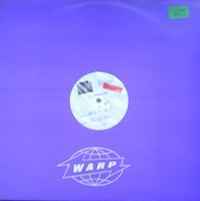 Comes in a standard Warp sleeve, label is Mayking Records and a sticker saying remix.